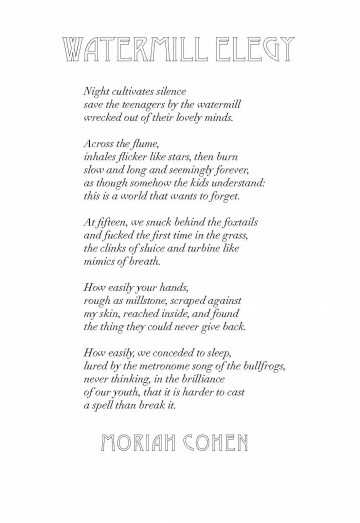 Moriah Cohen’s poetry has been published or is forthcoming in Hayden’s Ferry Review, Mead: The Magazine of Literature and Libations, Word Riot, and Narrative where she was runner-up in this year’s “30 Below” contest. She received her MFA from Rutgers University – Newark and currently teaches at Ramapo College. This poem is so tender. Those noisy kids down by the water don’t get told to keep quiet. Neither does the speaker’s younger self get a talking to about his or her behavior. Instead s/he lingers in the spell cast by those glowing cigarettes, remembering a similar night and its loss. It would be easy to stay in that moment, to make what’s elegized mere virginity, but Cohen doesn’t aim her mourning at “what [your hands] could never give back.” Instead her speaker focuses on the youthful ease that allows a person to casually do momentous things and then just as casually fall asleep. It’s the unencumbered mind that’s mourned here, an innocence more subtle than any physical experience. What’s missing in this poem is most important, so the typeface for the title needed to signal as much. Desdemona’s curves make a beautiful outline of both presence and absence. They also compliment the curves of Didot italic, which manage to be both sweeping (the lower case f’s especially) and regular, like waves in the water downstream from a water mill.